Seventy three percent of Australians aged 15-65 own a smartphone. 65% used their smartphone everyday over the past week and 77% don’t leave the home without their device. With the rise of mobile usage it’s no wonder some of Australia’s leading banks are now making the mobile customer experience a priority (Frost & Sullivan Australian Mobile Device Usage Trends 2013). However, since releasing our incredibly popular mobile banking app usability white paper in August 2013, it is surprising to see how little has changed in the Australian mobile banking app market! 1. Optional Transfers Customers have the option to make payments to a friend via Facebook, mobile number or their friend’s email address through the CommBank app. All the recipient needs is an Australian BSB and account number. Existing Commonwealth Bank customers will receive the funds directly into their account. Ensuring no-one is left out, anyone who is not a Commonwealth Bank customer will receive a text notification and a code from the sender to retrieve funds. 2. On-the-Go payments using NFC or PayTag CommBank has been one of the fastest movers on allowing customers to pay on-the-go using either NFC (near field communication) or their recently introduced PayTag technology. A PayTag will cost customers $2.99 and sticks to the back of the mobile phone, working just like a credit card for tap-and-go payments. 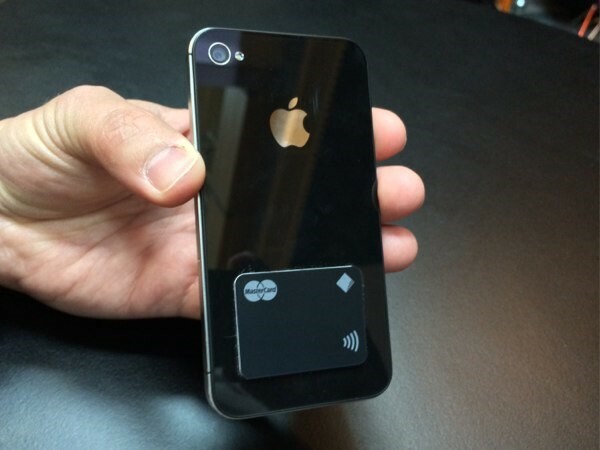 The PayTag is simple to install using on screen instructions, and is used by just tapping your phone as you would with a credit card. 3. Cards Top-Up Easily top your cards up while on the go. 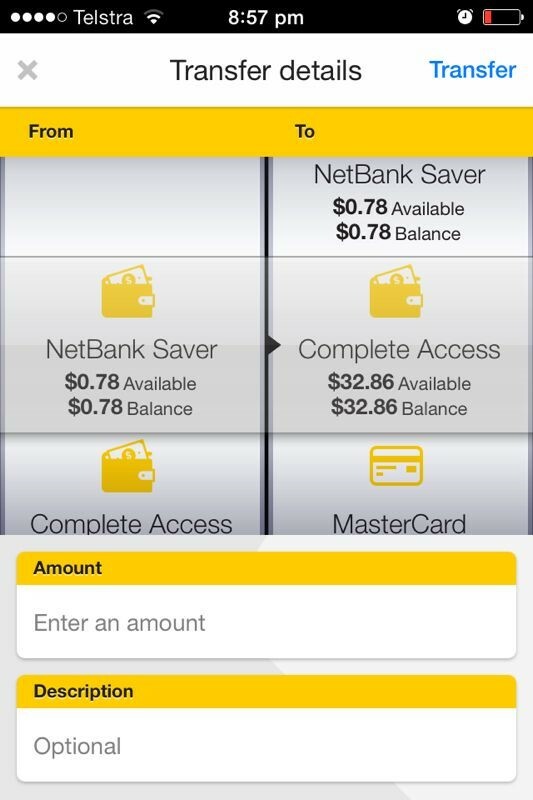 This is a particularly useful feature when using travel cards and need to quickly access accounts to transfer money to your Commonwealth Bank travel cards all in one place within the app. Once navigated to the “top up” feature, large credit card images are visually displayed on screen accompanied by a large “top up” button where customers can simply “top up” from one card to another. 4. Transfer between accounts Vertical scrolling wheel to select accounts for transfer ensuring there is minimal user input to complete the task. Only relevant information is visible on screen keeping design minimal, user friendly and removing the possibilities for user errors or confusion. 5. Usability and overall user experience The most common tasks performed by users are now visible with a clear call to action on the launch screen. As users have limited time and generally be on-the-go, it is important to consider the context in which the mobile app is used. 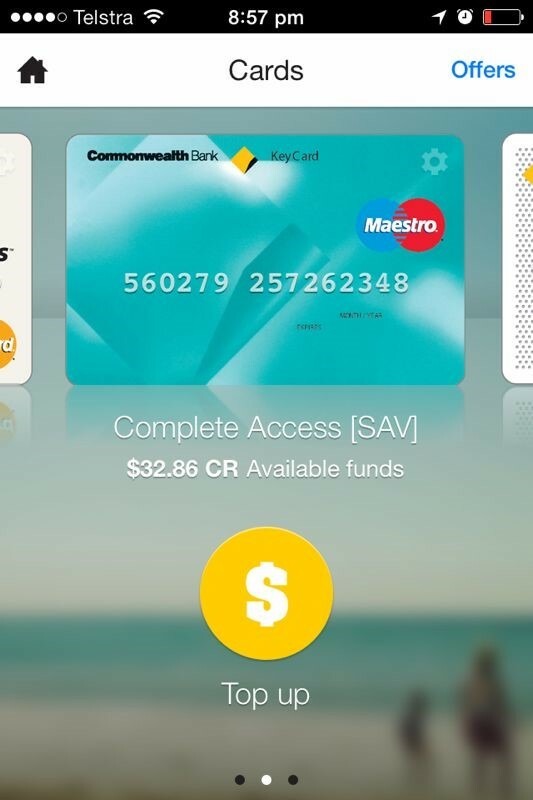 CommBank does a nice job of bringing these common tasks like account transfers, payments and tap and pay forward for their customers, whilst still keeping all app functions easily accessible through the main hamburger menu (top right). The mobile payment space may have started out somewhat slower than expected from Australia’s leading banks, however, with the ever-increasing rise in mobile use, together with customers demanding quick and usable payment solutions this is sure to change. This is evident with many of Australia’s leading banks currently releasing and/or testing new mobile payment solutions for their customers. 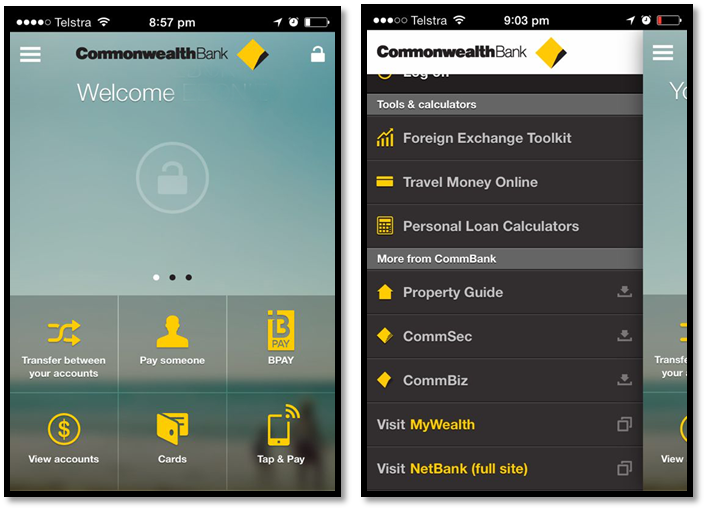 The examples provided show CommBank leading the way with updated features and usability making everyday tasks easier for their customers. It has never been more important to be considering the user experience of the product by researching and testing new solutions and designs with customers to evaluate how, when and why they may or may not use their mobiles for payment and everyday banking. Providing customers with an accessible, easy and useful mobile payment experience can go a long way in, not only ensuring they continue to use it, but that they will be one of your strongest advocates. So do you have a product or service you want to put in front of your customers? Find out about all your usability testing options and contact us for a quote! This entry was posted in Customer Experience, Mobile marketing, Objective Digital, Usability testing, User Experience, User research and tagged CBA, Commonwealth Bank, customer experience, improvements, mobile banking app, mobile testing, new features, usability, usability testing, user experience, User Experience Sydney by Objective Experience. Bookmark the permalink.